Dancing With the Stars Season 18 premieres tonight and all eyes will be on Sochi ice dancing darlings Meryl Davis and Charlie White (you two, are a mouthful). They’ve both got a bit of an unfair advantage in the competition considering they have that whole “professional athletic dancers” thing going for them, but their Olympic prowess isn’t what most Dancing With the Stars fans will be focusing in on. It’s their rumored romance that has been the center of their fandom’s rink. And though these two have spent 17 years together as ice dancing partners, they are (to many-a-fan’s disappointment) simply that, partners. It turns out professional soccer players aren’t the only athletes who are prone to turn up the acting. Davis’s and White’s romantic and dreamy performances at Sochi were so convincing that they had everyone believing they were together. But alas, these ice dancing champions really are just friends. They are the Kate and Leo of the Olympics, essentially. Belbin is also an Olympic ice dancer! That’s riiiight. Belbin won silver with her partner Benjamin Agosto in 2006 — making them the first US pair in over 30 years to have won a medal in ice dancing. Belbin and White are super cutesy on Twitter. They found love in a sushi place. They found love in a suuuuu-shhhiiii plaaaaa-aaaaa-aaaace. There is a dog named DJ involved who is the canine version of White’s own mop top. Tanith is a TV Personality. She’s covered red carpets, worked for Good Morning America, and was a figure skaing correspondant for the Sochi Olympics. And she clearly liked what she was seeing! 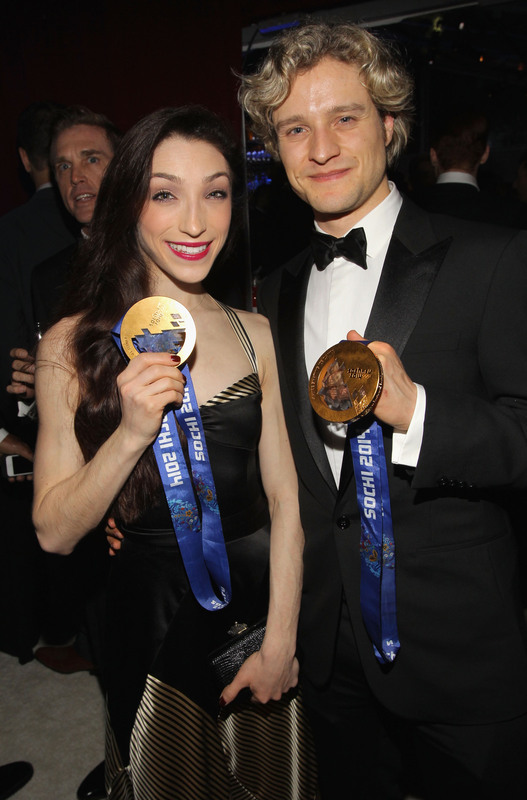 Aside from being Olympic ice dancers, White and Belbin are also both involved in celebrity competitions. Davis will premiere tonight on Dancing with the Stars and Belbin was the on-ice commentator for ABC’s Skating with the Stars. So apparently a dating website for “Olympic Ice Dancers Who Are Also Cast Members on Celebrity Competition Specials Looking for Love” is a thing. They probably met in the Shire. For starters her name is TANITH BELBIN and she’s 5’4” while Charlie White could easily pass as Pippin Took. I think I rest my case here.